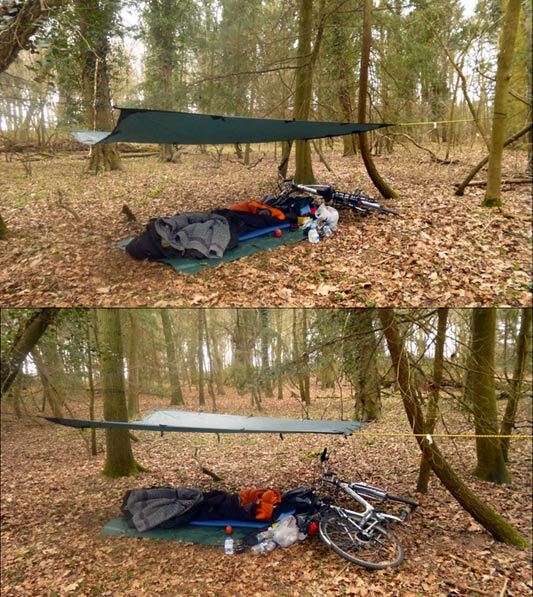 This camp was in Thetford Forest, some time in the middle of March 2015. I’d decided on a pitch a few days before going out on this adventure. On my last visit to the forest I saw an idyllic looking spot under a tree, just off a public footpath that ran through a breckland pasture. So I arrive at the entrance to the pasture and am surprised to find it padlocked and occupied by sheep, they weren’t there last time! I was a little perturbed by this but luckily I’d given myself enough time before sundown (1 hour) to find an alternate pitch. Having a Plan B in mind, or giving yourself enough time to make up a Plan B, is one of my top tips for any would-be wild camper. Not only do things have a nasty habit of changing but also, the map is not the territory. What looks great on Google maps may be completely wrong in the cold light of day (or what’s left of the day) for a wild camp. I hopped back on my bike (yes, I took my bike with me!) 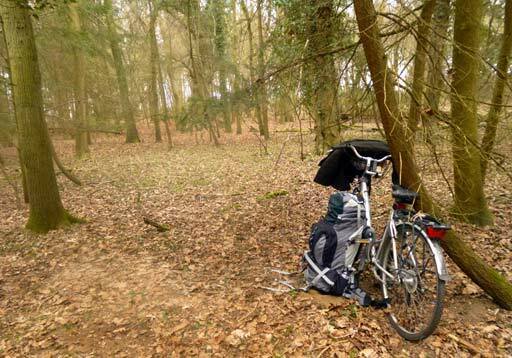 and cycled around for a while until I found a quiet little corner of the forest just right for camping. It’s really not hard to find a quiet little corner in Thetford Forest, the place is HUGE. I couldn’t see one bit of litter in my neck of the woods, no evidence of any other humans at all, perfect. With half an hour of daylight left I unpacked and rigged up the tarp. Once I had it all set up I walked twenty metres or so away from the camp and was pleased to see how well it blended into the surroundings. I like doing this as it it makes me feel safer. Well hidden…can you spot my camp? It was becoming a little nippy in the wood so I made hot chocolate laced with a generous helping of whisky. I sat back on my sleeping bag and watched the light gradually fade and night take over. By 8.00pm it was pretty cold so I wolfed down some rations (cake and bombay mix) and slid into my sleeping bag. It was a little early for sleep so I settled back reading my kindle and sipping whisky. By 10pm I was fast asleep. I woke at midnight, greatly surprised that I’d actually fallen asleep! Maybe I had broken my “no sleep on wild camp nights” routine? If so, then this was a great breakthrough. I usually spend ages waiting for sleep to come and when it does it rarely adds up to more than 3 or 4 hours. I read for a while and then spent some time just lying back listening to the wind in the trees. The next thing I new it was 6:30 am. Wow, a new wild camp sleeping world record for me! I leant out of the sleeping bag and put a cup of tea on the burner, a big, satisfied smile on my face, THIS is what it is all about. Tea and muffins in bed, in a forest, a fine thing to do on a Sunday morning. I made another tea and ate some more breakfast. 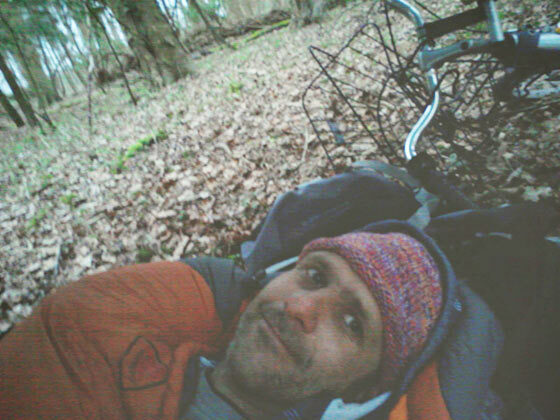 Feeling relaxed and lazy, I burrowed back into the sleeping bag and luxuriated in the glory of the wood. At around 9am I decided to break camp and twenty or so minutes later I was packed and ready to leave. On the way out I passed a pony, we looked at each other for a while, I saluted him and continued on my merry way back to the station. A wonderful wild camp in a lovely location and I slept a good seven hours or more, unheard of for me! Congratulations on so much sleep! Hopefully you’ll be able to get plenty of sleep from now on in your wild camps. I completely agree with you about having enough time for a Plan B. A similar thing happened to me yesterday. I arrived at the little patch of wood I wanted to sleep in, only to find it was fenced off. It was sooooo good to have a decent night’s sleep. Yep Plan B is essential, I’ve been caught out a couple of times in the past and am determined it won’t happen again. I love a hot choc on a wild camp, it’s a good alternative in the evening to a cuppa tea which might keep me awake. Glad you enjoyed the post! Great blog post and a reminder that we must have a family adventure down to Thetford Forest this summer. I agree every plan needs to be adaptive. On our March Microadventure wild camping trip to Snowdonia, Ewan and I spent a bit of time wandering around with a tent peg each looking for soil deep enough to get the tent pegs in. We were glad of plenty of time to get the tent up before dark. Glad you enjoyed the post. 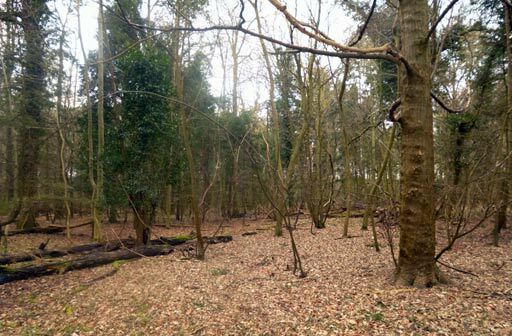 Thetford Forest is a great place for adventure, with one caveat, you’ll need to keep an eye out for ticks as the weather improves, they love the deer in the forest. Thank you for the warning about the ticks, we will make sure to pack the tick remover. Can you recommend a good campsite in or around Thetford Forest? 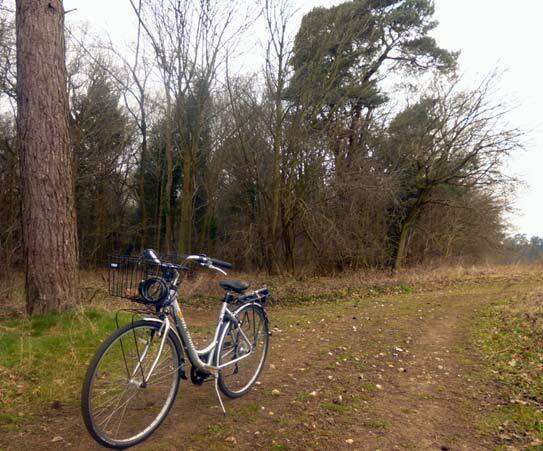 We are considering Braham Farm campsite near Ely although ideally it would be great to stay closer to the forest. Hi Richard, I’m afraid I don’t know any authorised campsites near Thetford Forest, I’m sure there are some though. The longer nights at this time of year help you sleep. Try Bing Maps as you can select Ordnance Survey view to suss out places to go. I never find any trouble finding places to wild camp in the countryside, I doubt that you’re ever more than 10 minutes from a suitable spot really. I’ve long been a fan of Bing Maps for the OS layer, makes planning really easy. Hi Dave, glad you enjoyed the post. Do you have any plans for a wild camp? Beautifully planned as always Martin to get the best pitch and sleep Wonderful sylvan site in Thetford forest . Liked the bike idea. The bike was really handy, though I need to invest in some decent panniers. Glad you enjoyed the post Bob! Lovely! I’m glad it worked out so well for you in the end! I was hoping you’d blog about your micro-adventure in Thetford Forest. I use litter as a measure of how undisturbed I’m going to be in the forest. Sad commentary on my fellow humans. The less litter, the less people. On blustery days the wind in the pines sounds and looks like a huge, invisible beast is rushing through the treetops. Love it. Enjoyed your post, Martin. Glad to see you seem to have triumphed over your sleep problems. I have read your blog twice now mate, I don’t live a million miles away from that ford and need cheeky night out there. Looks like a great spot (marked down for future reference), would have liked a bit more cover though. hi there martin, i think this post is actually amazing! 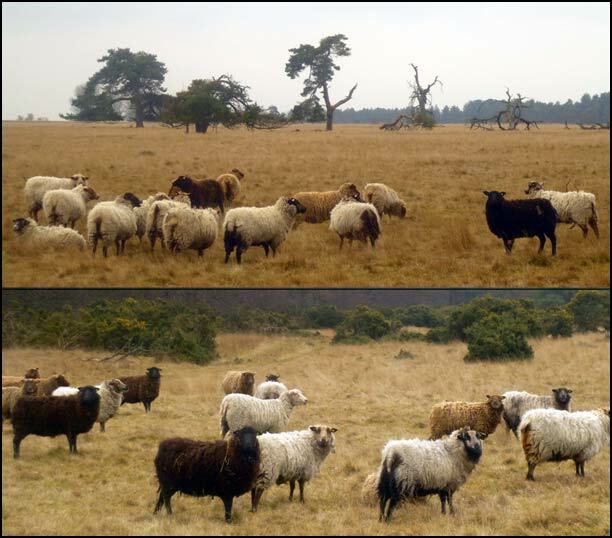 thetford forest is the closest forest to me and even then its over an hours drive for me. could i ask where abouts you stayed? not so i can go and take your spot but just to get an idea of where the thickly wooded areas are. was you anywhere near high lodge? i am thinking about trying this myself and am wondering where to go, i know to keep well clear of the firing range haha. also how did you get up there did you drive or just take the bus? this seems a great idea so long as you dont get caught. Sounds like my kind of adventure. Did you ask for permission before camping?